When their 6-year old twin boys entered the first grade in Los Angeles back in 2006, Jay and Tracie Oken received a printed class directory so they could coordinate play dates, carpooling, and other activities. While it contained important information for parents, “it was a mess,” said company president, Tracie Oken. “So we volunteered to create a new one for the school and before long, we helped other schools in the area.” In 2008, they launched their desktop application and currently serve Parent Teacher Organizations (PTO) in approximately 1,000 schools across the nation. Originally, the company wanted to leverage the development team they had in place using HTML5, but it was quickly clear that there were unexpected complexities when adapting HTML5 for different touch capabilities and screen sizes. By October, the team knew they needed a different approach, but that left them with a tight deadline just six months before the spring sales season. If they couldn’t make a May 1 deadline, they would miss one of the two top selling seasons, and the revenue that went with it. "There are just so many things you can do in Alpha with a few clicks of a button." Once MySchoolAnywhere launched its online and mobile solution, the company realized a 60% revenue increase in under a year. Not only were schools very happy with the mobile application, but it was easy to use and scale, giving MySchoolAnywhere the opportunity to upsell customers to its premium services. Since May 1st, more than 350 schools have signed up. At about 600 families per school, that's 210,000 people-thousands of logins per day. 1. A Fast Path to Mobile and Web Apps: The MySchoolAnywhere team built a design document for the online and mobile application from their desktop and showed developers what they needed to do, step-bystep. The Alpha platform offered built-in capabilities for reporting, emailing, login access, and more. “If we had to build the core from scratch, it would have taken three times as long. But with Alpha, we made our May 1st deadline,” said Tracie. 2. A Tool to Lower Development Costs: While the team knew they had to go mobile, the business model could not afford a long, complicated development process. The reasonable entry price of Alpha Software—plus the fast development cycle which minimized developer hours—really mattered. By making current developers proficient in both mobile and web app development, the company realized dramatic cost savings, while still taking the business mobile. 3. A Complete, End-to-End Development Platform: Alpha gave the MySchoolAnywhere development team the capabilities to manage the data, build the dialogue and the grid. The open platform allowed team members to tackle the different components based on their various strengths and skill sets, and also made it easy for the team to collaborate. “Alpha gave us the reporting tools not only at the back-end, but at the front-end, too—making a complete package,” said Jay Oken. 4. A Competitive Advantage: While a print directory didn’t afford the company with a strong competitive selling point, the team knew the right mobile application could. As a result, the MySchoolAnywhere team was committed to making the mobile app easy to use and visually stunning. Using a skeleton development team, MySchoolAnywhere had the tested, mobile app they desired by deadline, and the solution ran like a native app experience on any mobile device or PC. Once MySchoolAnywhere launched its online and mobile solution, the company realized a 60% revenue increase in under a year. 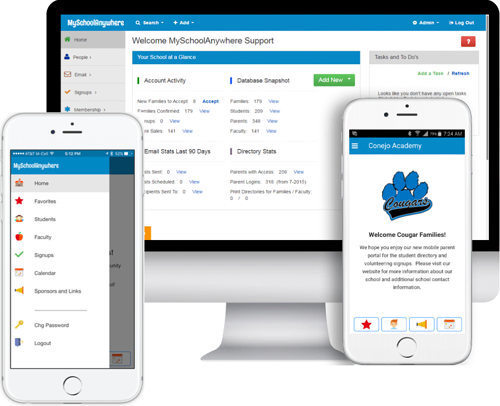 Not only were schools very happy with the mobile application, but it was easy to use and scale, giving MySchoolAnywhere the opportunity to upsell customers to its premium services. Once MySchoolAnywhere launched its online and mobile solution, the company realized a 60% revenue increase in under a year.